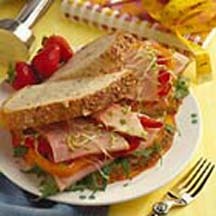 CooksRecipes has quality, kitchen-tested recipes for a variety of ham sandwiches that you can count on for successful deliciousness. This layered ham sandwich maintains its healthful profile between seven-grain bread. A tribute to Dr. Suess' storybook, Green Eggs and Ham. 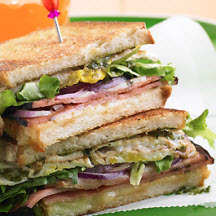 Slices of ham are layered with a fried egg, mixed baby greens and basil pesto on sourdough bread. 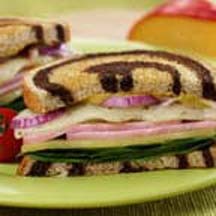 An eye-appealing and delicious sandwich made with ham, Gouda and dill-flavored Havarti cheese on marble rye bread with thinly sliced red onion and spinach leaves.